What a great biography of a man not too many (if any!) students will have heard of. But I'm sure they all know the song "Home on the Range." Deborah Hopkins calls this "historical fiction" but I think she is just being overly cautious. She based the book primarily on John A. Lomax's autobiography, but says that autobiographies are not always accurate. The cataloging information for this book lists it as a biography, so the Library of Congress felt confident enough in the information to list it as nonfiction.I would love to read this aloud to students, but I feel like it needs a CD of the songs to go along with it! I'm not confident enough in the melody of some of these songs to be able to sing them on my own. And yet it would add so much to the reading to be able to sing the songs. If I do end up sharing this with classes, I will want to find recordings of these songs, if possible. Hopkinson has written another fascinating, tightly focused story about an interesting American that most children will enjoy discovering.In this well-paced picture book, she deftly portrays the man credited with popularizing such songs as "Home on the Range" and "Sweet Betsy from Pike." Hopkinson traces Lomax's boyhood love of cowboy songs in Texas to his tramps across the country, asking a variety of folks to sing for him so he could record their songs -- thereby preserving a significant part of our musical heritage. Interspersed with the spare story are excerpts from the lyrics Lomax collected. Schindler's engaging line and wash illustrations often spread over two pages, evoking the wide-open countryside. An author's note provides additional information about Lomax and American folk songs. 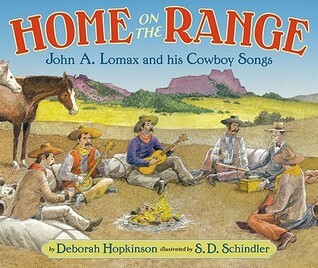 I grew up singing Home on the Range and loving cowboy songs, so this book is right up my alley. I loved the illustrations, loved the text, and the notes at the end just made me want to learn more about John Lomax. Let's hope future generations don't forget the words to "Home, home on the range - where the deer and the antelope play - where seldom is heard a discouraging word, and the skies are not cloudy all day." I truly believe the words to this song, heard over and over again as a child, helped me become an optimist in life. Let's keep singing it. Hopkinson calls this historical fiction, but it seemed very likely to me. I doubt that she took very many liberties with the story especially since she only really focused on the first half of his life. She doesn't talk about the things he did while he was collecting songs such as meeting his first wife, but keeping the focus on the folk songs keeps the book short, simple and easy for a child to follow and enjoy. She does provide additional resources to find out more about Lomax if the child has the urge. Another outstanding biography from Deborah Hopkinson, this one focused on the life of John Lomax, the collector of American folk music before the thought was popular. This also accounts for historical descrepancy regarding a tumultuous event in his early life in which he burned his entire childhood collection of fold music. I loved this book. It was very impressive and the illustrations were beautiful as well. I love Historical Fiction that is mostly true!! LOVED! I probably need to do some research but I would love to hear those original recordings of the cowboys and others John Lomax recorded! Very interesting book! Fun Late elementary book! Of course you know I love the author's notes...they are a must read!! The story of how John Lomax collected cowboy songs like "Home on the Range" and "Sweet Betsy from Pike." Nice little history of John A. Lomax. Thank heavens someone saw value in preserving these old folk songs. Great pics and fun songs and story. This is a great biography of a boy following his dreams and how John A. Lomax collected his cowboy song. This can be enjoyed from Kindergarten+. I didn't really like this book. There were alot of songs in here though that maybe could be sung in class if you were doing a rodeo type theme or learning about Indians and western culture. Excellent book, fun illustrations. Very enjoyable. What a great introduction to an interesting subject and man. I can definitely see this one being used by teachers. About a man who preserved many of the old cowboy and folk songs.5/2/17 Read with Naomi & Julia. Deborah Hopkinson S.D. Schindler - I write picture books, nonfiction, and middle grade fiction. I love history and visiting schools to talk to young readers. My new books in 2018 include ORDINARY, EXTRAORDINARY JANE AUSTEN and D-DAY: The Invasion that Changed History. Recent awards for picture books include the Jane Addams Peace Association Award for STEAMBOAT SCHOOL and the 2017 Green Earth Book Award for FOLLOW THE MOON HOME.My nonfiction includes TITANIC: VOICES FROM THE DISASTER, a 2013 Sibert Honor Book and a 2013 YALSA Excellence in Nonfiction Finalist. COURAGE & DEFIANCE, Stories of Spies, Saboteurs, and Survivors in WWII Denmark is an Orbis Pictus Recommended Book and won the OCTE Spirit Award for Nonfiction and an Oregon Book Award. DIVE! is also an Orbis Pictus Recommended Book.My historical fiction title, A BANDIT's TALE, was named a Charlotte Huck recommended book. THE GREAT TROUBLE, A MYSTERY OF LONDON, the BLUE DEATH and A BOY CALLED EEL, won an Oregon Spirit Award.My 2017 books included A LETTER TO MY TEACHER and INDEPENDENCE CAKE as well as a story in GUYS READ: HEROES and VILLAINS. I live in ORegon.